A few weeks ago I wrote a post about my trip to the Lush blogger event, where they kindly treated us to a few Lush goodies! 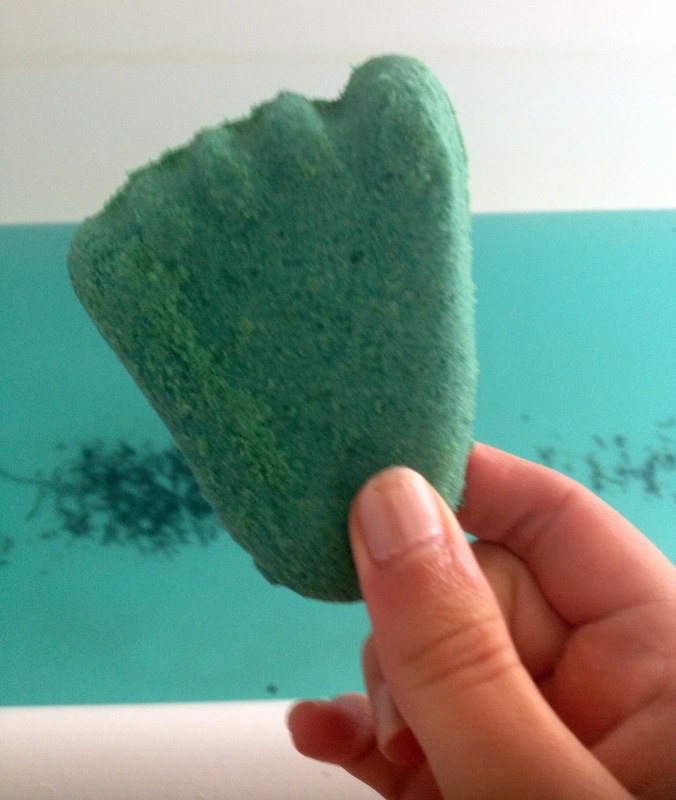 This is Stepping Stone; One of Lush's many wonder- products which aims to give a bit of TLC to your feet! Firstly, the smell of this product is just amazing. It was sat in my Lush bag in my room for a day or two and it fragranced my entire bedroom with refreshing, citrus smells. It is made up of Sodium Bicarbonate,Pumice Powder,Citric Acid,Organic Jojoba Oil,Fine Sea Salt,Cocoa Butter,Lemongrass Oil,Gardenia Extract, Lemon Oil,Lime Oil,Water (Aqua),Lycopodium Powder,Citral*Geraniol*Citronellol*Limonene*Linalool*Perfume, Colour 42090- all of which are either natural ingredients or safe synthetics. To use this product you can either break off pieces and use it directly on damp feet as an exfoliator or you can use it as a mini bath bomb for your foot spa as it fizzes when it hits the water. I used a bit of both! I like to think that I have sensitive feet, and I've used real pumice stone in the past which has been way to harsh for me and irritated my skin. However, when I used this product which has pumice powder in it, it made them feel wonderful! It totally looks like I'm naked here- but I promise I was wearing shorts! I think I could even say that this is the best foot product I have ever used; It is softening and effectively gets rid of all dead skin cells without being harsh or uncomfortable to use. Not only does the product smell amazing, but it makes your feet smell great too as it has deodorising properties! The cocoa butter and organic jojoba oil in Stepping Stone stopped my feet from drying out and made them feel as soft as a pillow. You know that feeling when you take your socks off in bed on a cold sheet and it feels like heaven?.. that's what this made my feet feel like. Really good. I used some of the foot scrub after my bath with a Lush bath bomb which I will be reviewing very soon! Overall I am so glad that I had the chance to use this great product. I will definitely be repurchasing this one! Thanks again to Lush Plymouth for inviting us to the evening and giving us the chance to use some of the products! 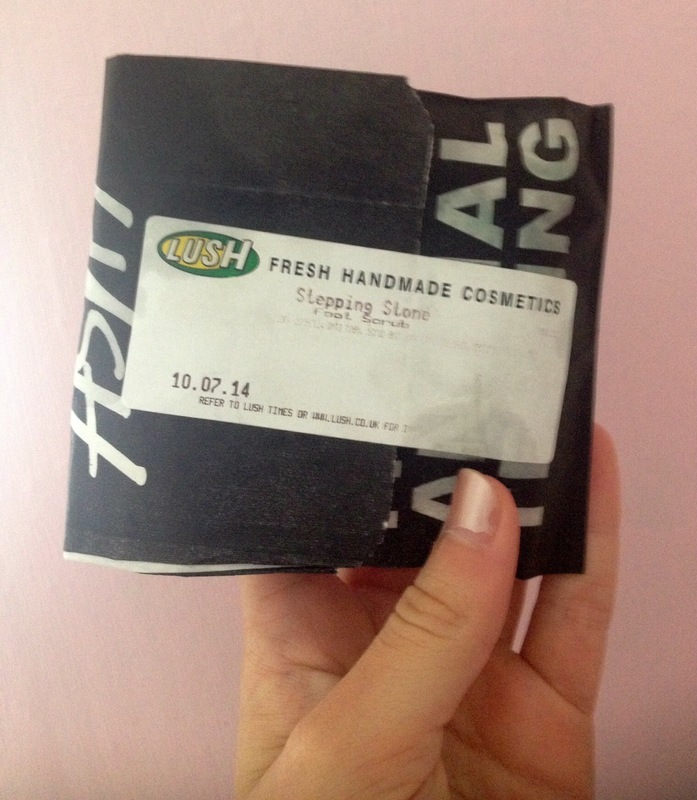 Disclaimer: Lush Plymouth gave me this product from their blogging event but all opinions are honest and my own. Ahh this seems like such a great product! It's so cute how you showed how you used this, so true to real life and how most of us would be doing this at home, hehe!